The European Union (EU) is a supranational and intergovernmental union of twenty-seven states. It was established in 1992 by the Treaty on European Union (The Maastricht Treaty), and is the de facto successor to the six-member European Economic Community founded in 1957. Since then new accessions have raised its number of member states, and competences have expanded. The EU is the current stage of a continuing open-ended process of European integration. The EU is the largest economic and political entity in the world, with 494 million people and a combined nominal GDP of €11.6 (US$14.5) trillion in 2006. The Union is a single market with a common trade policy, a Common Agricultural/ Fisheries Policy, and a Regional policy to assist underdeveloped regions. 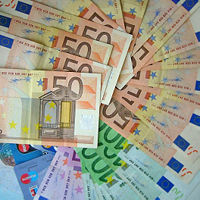 It introduced a single currency, the euro, adopted by 13 member states. The EU initiated a limited Common Foreign and Security Policy, and a limited Police and Judicial Co-operation in Criminal Matters. Important EU institutions and bodies include the European Commission, the Council of the European Union, the European Council, the European Central Bank, the European Court of Justice, and the European Parliament. Citizens of EU member states are also EU citizens: they directly elect the European Parliament, once every five years. They can live, travel, work, and invest in other member states (with some restrictions on new member states). Passport control and customs checks at most internal borders were abolished by the Schengen Agreement. The EU has evolved from a western European trade body into the supranational and intergovernmental body that it is today. After the Second World War, an impetus grew in western Europe for institutional forms of cooperation (through social, political and economic integration) between states, driven by the determination to rebuild Europe and eliminate the possibility of another war between Germany and France. Eastern Europe, on the other hand, was largely within the Soviet sphere of influence, and only in the 1990s did the EU see central and eastern European states as potential members. In 1946 Winston Churchill called for a " United States of Europe" (though without the inclusion of the UK). On 9 May 1950 the French foreign minister Robert Schuman presented Jean Monnet's proposal for the joint management of France's and West Germany's coal and steel industries. The proposal, known as the " Schuman Declaration", envisaged the scheme as "the first concrete step towards a European federation". It is considered to be the beginning of the creation of what is now the European Union, and led to the formation of the European Coal and Steel Community by West Germany, France, Italy and the Benelux countries. This was accomplished by the Treaty of Paris, signed in 1951. The first full customs union - the European Economic Community - was established by the Treaty of Rome in 1957 and implemented on 1st January 1958. This later changed to the European Community, which is now the "first pillar" of the European Union created by the Maastricht treaty. On 29 October 2004, EU member state heads of government and state signed the Treaty establishing a Constitution for Europe. This was later ratified by 17 member states. However, in most cases ratification was based on parliamentary action, rather than popular vote, and the process faltered on 29 May 2005 when French voters rejected the constitution 55% to 45%. The French rejection was followed three days later by a Dutch one, in which 62% of voters rejected the constitution as well. The territory of the European Union is formed by the territory of its twenty-seven member states, and expands with the accession of new members. It covers an area of 4,422,773 square kilometres (1,707,642 sq mi). Extending northeast to Finland, northwest to Ireland, southeast to Cyprus and southwest to Portugal, it represents the seventh largest territory in the world by area. It is estimated that the coastline of the European Union is over 150,000 km long. The EU is not coterminous with Europe: significant parts of the continent (e.g. Switzerland, Norway, European Russia) are outside of the EU. The member states of the EU have land borders with 21 other nations. Several overseas territories and dependencies of various member states are also formally part of the EU (e.g. the Azores, Madeira, French Guiana, Martinique, Guadeloupe or the Canary Islands) while in other cases territories associated with member states are not part of the EU (e.g. Greenland, the Faroe Islands, most territories associated to the United Kingdom, Aruba, the Netherlands Antilles or New Caledonia). Including overseas territories of member states, the EU includes most types of climate from Arctic to tropical. Meteorological averages for the EU as a whole are therefore not meaningful. The majority of the population live in areas with a Mediterranean climate (southern Europe), a temperate maritime climate (western Europe), or a warm summer continental or hemiboreal climate (in eastern member states). a On 3 October 1990, the constituent Länder of the former East Germany acceded to the former West Germany, automatically becoming part of the EU. b In 1985, following a referendum, Greenland, which was granted home rule by Denmark in 1979, left the European Community. Note that certain areas of the member countries are not part of the EU, like the Channel Islands, or the Faroe Islands. Areas that are far from Continental Europe on the other hand may be part of the EU: for instance, the Azores, and Madeira islands (Portugal), are represented by that country in EU affairs. Also the various French overseas departments are considered part of France, which is why areas as far from Europe as Martinique and French Guiana use the Euro. Supporters of the European Union argue that the growth of the EU is a force for peace, democracy, and prosperity for its member states. However, the causal factors of war and peace are a controversial theoretical issue. Others contend that peace in Europe since World War II is the product of other causes, such as the moderating influence of the United States and the Soviet Union within their respective power blocs, and the mutual external threat for the other bloc/alliance, the need for reconstruction after World War II, and a collective temporary tiring of waging war, and that the dictatorships cited came to an end for entirely different reasons. The nature and future direction of the European Union itself is a key issue in European politics and a significant issue in the national politics of the member states. General issues include whether or not to belong to the EU, the impact of the EU on the member states, sovereignty issues, economic harmonisation issues, what the EU is becoming and should become (i.e. a single country in itself or a club of individual countries), the ultimate size of the Union, limits on new accession, the pace of new accessions, expansion in membership versus internal integration, a future as a political union versus a future as a free trade zone, the geographical limits of "Europe" for membership purposes, and the values and historical-cultural identity of the Union. Internal structure, procedures and policies are themselves subject to constant political debate. 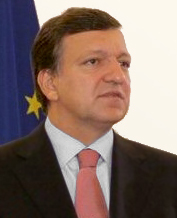 Specific issues at present include the status and future of the constitutional treaty; enlargement on the Balkans and Turkish accession; problems of financial probity and democratic accountability; relative economic viability; revision of the rules of the Stability and Growth Pact; and the Common Agricultural Policy. The Financial Perspective for 2007–2013 was defined in 2005 when EU members agreed to fix the common budget to 1.045% of the European GDP. UK Prime Minister Tony Blair agreed to review the British rebate, negotiated by Margaret Thatcher in 1984. French President Jacques Chirac declared this increase in the budget will permit Europe to "finance common policies" such as the Common Agricultural Policy or the Research and Technological Development Policy. France's demand to lower the VAT in catering was refused. Controversial issues during budget debates include the British rebate, France's benefits from the Common Agricultural Policy, Germany and the Netherlands' large contributions to the EU budget, reform of the European Regional Development Funds, and the question of whether the European Parliament should continue to meet once a month in Strasbourg. The Treaty establishing a Constitution for Europe (TCE), commonly referred to as the European Constitution, is an international treaty intended to create a constitution for the European Union. The constitution was rejected by France and the Netherlands, where referenda were held causing other countries to postpone or halt their ratification procedures. The constitution now has an uncertain future. 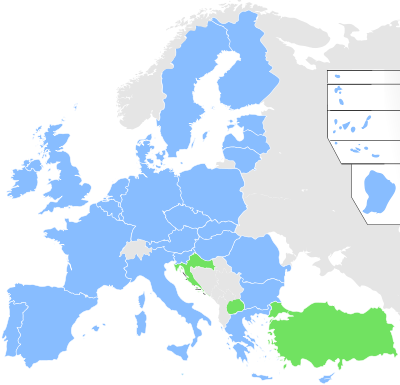 As of February 2007, Austria, Belgium, Bulgaria, Cyprus, Estonia, Greece, Hungary, Italy, Latvia, Lithuania, Luxembourg, Malta, Romania, Slovenia and Spain have ratified the constitutional treaty. Finland, Germany and Slovakia have completed parliamentary procedures required for ratification. Spain and Luxembourg held referenda, thus in those member states the constitution was ratified by popular vote. The 'pillar' structure created by the Treaty of Maastricht moved the older policies and activities into the 'first pillar, labeled the 'European Communities'. The more controversial new policy areas - foreign policy, security and defence, asylum and immigration, and judicial co-operation - were moved into two new 'pillars'. A prominent policy goal of the European Union is the development and maintenance of an effective single market. Significant efforts have been made to create harmonised standards claimed by their proponents to bring economic benefits through creating larger, more efficient markets. Since the Treaty of Rome, policies have implemented free trade of goods and services among member states, and continue to do so. This policy goal was further extended to three of the four EFTA states by the European Economic Area, EEA. Common EU competition law restricts anti-competitive activities of companies (through antitrust law and merger control) and member states (through the State Aids regime). The EU promotes free movement of capital between member states (and other EEA states). The members have a common system of indirect taxation, the VAT, as well as common customs duties and excises on various products. They have a Common Agricultural Policy (with the Common Fisheries Policy) and the structural and cohesion funds, which improve infrastructure and assist disadvantaged regions. Together they are known as the cohesion policies. The EU also has funds for emergency financial aid, for instance after natural disasters. The funding extends to programmes in candidate countries and other Eastern European countries, as well as aid to many developing countries, through programmes such as Phare, TACIS, ISPA. The EU also funds research and technological development, through four-year Framework Programmes for Research and Technological Development. In a more political sense, the EU attempts to create - with much controversy - a sense of European citizenship and European political life. That includes freedom for citizens of the EU to vote and to stand as candidates in local government and European Parliament elections in any member state. The European Parliament is now attempting to create pan-European political parties, and almost all members have joined at least a federation of national political parties. Defence and security are traditionally matters of national sovereignty. 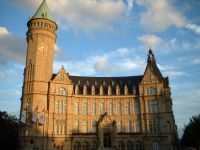 EU policies in this area were established as the second of the three pillars in the Maastricht treaty of 1992. The Common Foreign and Security Policy or CFSP were further defined and broadened in the Amsterdam Treaty of 1997. It superseded the European Political Cooperation. The CFSP acknowledges NATO being responsible for territorial defence of Europe and "peace-making". In 1999 the European Council took over responsibilities for the implementation of peace-keeping missions ( EUFOR in Bosnia Herzegovina, Congo) and policing of treaties. The supervision is coordinated by the High Representative for the Common Foreign and Security Policy, Javier Solana. The European Security and defence Policy is an element of the CFSP and stipulated the framing for policies that could deal with humanitarian and rescue tasks, and tasks of combat forces. It includes the creation of a 60,000-member European Rapid Reaction Force for peacekeeping purposes, an EU military staff, a European Defence Agency and an EU satellite centre (for intelligence purposes). The third of the three pillars of the European Union is focusing on cooperation in criminal matters, including sharing of intelligence (through Europol and the Schengen Information System), agreement on common definition of criminal offences and expedited extradition procedures. It is the EU instrument of law enforcement and combating racism. It was created as the Justice and Home Affairs pillar in the Treaty of Maastricht; subsequently the Treaty of Amsterdam transferred the areas of illegal immigration, visas, asylum, and judicial co-operation to the integrated first ( European Community) pillar. The term Justice and Home Affairs now covers these integrated fields as well as the intergovernmental third pillar. The foreign relations of the European Union are primarily a domain of the member-states, although the Union as a whole is beginning to exercise some influence through its Common Foreign and Security Policy (CFSP). External representation is handled by the High Representative for the Common Foreign and Security Policy and the European Commissioner for External Relations. The Commission is gaining greater representation in bodies such as the United Nations and G8. Policy is agreed on an inter-governmental basis however the general effect of the Union is also felt through Enlargement; the attraction of membership is taken as a major factor contributing to reform and stabilisation of the former Communist countries in Eastern Europe. The Union and its member states also contribute €43 billion in humanitarian aid; making it the largest humanitarian aid provider in the world. These factors influencing other countries are generally referred to as "soft power", as opposed to military "hard power". On the world stage the Union is gaining greater influence and ability to speak as a bloc. All 27 member states are represented in the World Trade Organization (WTO) through its Trade Commissioner, Peter Mandelson. The latest WTO negotiation round has currently stalled, partly due to European refusal to curtail the agricultural subsidies unless other developed countries would also stop subsidising their agricultural producers. Europe has had a long history with the United States, being particularly close during the Cold War. The US initially supported the development of the European Community and ensured the defence of the continent through NATO. However recently there has been friction between the United States and the modern European Union, for example over the Iraq war. Some individual member state governments have backed the USA over the war revealing weaknesses in forming a coherent foreign policy. It all started with the six countries of the European Coal and Steel Community in 1952. Today there are 27 European Union member states. There have been six enlargements, with the largest occurring on 1st May 2004, when 10 states joined, and the most recent occurring on 1st January 2007, when Bulgaria and Romania joined. 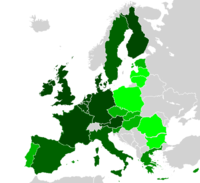 In order to join the European Union, a state needs to fulfill the economic and political conditions generally known as the Copenhagen criteria (named after the Copenhagen summit held in June 1993). These basically require a secular, democratic government, rule of law, and corresponding freedoms and institutions. According to the EU Treaty, any enlargement must be agreed to by every current member state as well as the European Parliament. The European Union is more pro-expansion on small nation states such as Georgia and Moldova to join the EU rather than larger nations such as Russia or Turkey, this is because smaller nations can be developed much more quickly than larger ones. Turkey is an official candidate to join the European Union. Turkish European ambitions date back to the 1962 Ankara Agreements, and Turkey started preliminary membership negotiations on 3 October 2005. However, analysts believe 2015 is the earliest date the country can join the union because of the large number of economic and social reforms it has to complete, and because the 2007– 13 budget does not take into account any of the considerable costs Turkey's accession will involve. Because of occupation of 1/3 of the Cyprus and Turkey's geographic setting many argue that Turkey must not be accepted to E.U. (only 3% of its territory lies in Europe). However, the Copenhagen criteria do not impose strict geographic conditions as EU member Cyprus is geographically an island in the Middle East. Lately, there have been reports on growing divisions between the EU and the Turkish government,, including discontent on the Turkish side, which feels it is capitulating to EU demands without receiving anything in return for its efforts. After EU institutional reforms and proposed modernisation, Croatia is likely to become the next EU member state. 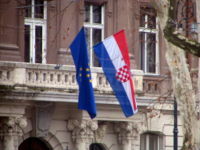 Croatia is an official candidate country to join the EU and started accession negotiations in 2005. 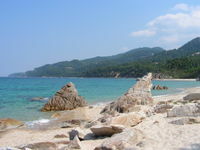 In June 2006, the EU officials projected that the accession of Croatia would likely happen in 2009. The closure of negotiations for all chapters of the acquis communautaire is expected towards the end of 2008, with the signing of the Accession treaty and membership occurring in January or May 2009. The Republic of Macedonia became an official candidate in December 2005.. Issues to be resolved include the controversy with Greece over use of the name Macedonia, and the country's poor relations with Bulgaria. Greece has clearly stated that it will veto the Republic's accession unless the name dispute is resolved. Albania, Bosnia and Herzegovina, Montenegro and Serbia are officially recognized as potential candidates. Norway and Switzerland, however, rejected applying for membership in separate referendums. Iceland is also touted as potential applicant but is opposed to the Common Fisheries Policy. The European Union is governed by a number of institutions, these primarily being the Commission, Council and Parliament. The European Commission acts as an executive or civil service of sorts. It is currently composed of one member from each state (currently 27) and is responsible for drafting all proposed law, a duty on which it maintains a monopoly in order to co-ordinate European Law. It also controls some agencies and the day-to-day running of the Union. Its president is nominated by the European Council then elected by the Parliament. The Council of the European Union (aka the Council of Ministers) forms one half of the Union's legislative branch (the other being the Parliament). It is composed of the national ministers responsible for the area of EU law being addressed, for example a law regarding agriculture would go to a Council composed of national agriculture ministers. This body should not be confused with the European Council below or the non-EU body, the Council of Europe. The body's presidency rotates between the member states every 6 months, though the current president member state co-operates with the previous and future president member state, to provide continuity. The European Parliament is the only Union body composed of officials directly elected by the citizens of the EU member states. Every 5 years citizens in all member states vote across a few days for 785 " MEPs" who form the second half of the Union's legislative branch. Its members sit according to political groups rather than nationality and its president is elected by its members. The European Central Bank is controlling the monetary policy within the Eurozone, consisting of 13 member states. 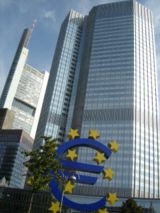 The ECB was established in 1998 and its headquarters is located in Frankfurt, Germany. The Judicial branch of the Union consists primarily of the European Court of Justice composed of one judge nominated by each member-state with the president elected from among those nominees. Below the Court of Justice there is a lower court called the Court of First Instance created to lift some of the work load of the Court of Justice. There is also the European Court of Auditors which monitors the Union's accounts. Another major body, though not an official institution, is the European Council, composed of the heads of government (along with the President of the European Commission) meeting 4 times a year. It shares its presidency with that of the Council of the European Union. There are also the two advisory committees; the Committee of the Regions and the Economic and Social Committee. In 2004, the constitutional treaty was signed in Rome by representatives of all EU member states. Subsequently, it was ratified by 15 member states, and rejected in French and Dutch referenda. European Union law is the first and only example of a supranational legal framework. According to the European Court of Justice, in one of its earliest cases, it constitutes "a new legal order of international law". Sovereign nation states, by becoming EU members, pool their authority for the mutual social and economic benefit of their peoples. The principle of subsidiarity means that laws are passed at the regional level where they are more effective when member states take action by themselves, while EU law is supreme in its own fields. The two main treaties which form the basis of EU law are the Treaty of the European Community, or the Treaty of Rome from 1957, and the Treaty of the European Union, or the Maastricht treaty of 1992. The Treaty of Rome is the so called 'first pillar' of the EU. The "European Community" refers to the competence of the EU to act in the social and economic arena. The Maastricht treaty formed the new European Union, and added two further "pillars". These are a common foreign and security policy and justice and home affairs. In both these fields a consensus among member states is needed to act. EU law covers a range as broad as many member states themselves. Where a conflict arises between EU law and the law of a member state, EU law takes precedence, so that the law of a member state must be disapplied. Both the provisions of the Treaties, and EU regulations are said to have " direct effect" horizontally. This means private citizens can rely on the rights granted to them (and the duties created for them) against one another. For instance, an air hostess may sue her aeroplane company employer for sexual discrimination. The other main legal instrument of the EU, "directives", have direct effect, but only "vertically". Private citizens may not sue one another on the basis of an EU directive, since these are meant to be addressed to the member state. Directives allow some choice for member states in the way they translate a directive into national law. Once this has happened citizens may rely on the law that has been implemented. They may only sue the government "vertically" for failing to implement a directive correctly. An example of a directive is the Product liability Directive, which makes companies liable for death and any other injuries that occur. Taken as a single entity, the European Union has the largest economy in the world, with an estimated nominal GDP of €11.6 ($15.8) trillion Commuter effects distort GDP figures for urban areas with large commuting flows, but even when measured at a scale where such distortion does not apply (e.g. Ostösterreich compared to Romania Nord-Est), there is still a 5-to-1 difference between average western European levels and the poorest regions of new member states. 172 companies of the Fortune Global 500 have their seats in EU countries - Nokia headquarter, Espoo, Finland. Differences between member states are also significant. GDP per capita is often 10% to 25% higher than the EU average in the "older" western member states, but only comprises one-third to two-thirds of the EU average in most eastern member states, as well as in potential membership candidates such as Croatia, the Republic of Macedonia and Turkey. By comparison, United States GDP per capita is 35% higher than the EU average: Japanese GDP per capita is approximately 15% higher. The European Union is the largest exporter in the world and the second largest importer. Internal trade between the member states is aided by the removal of barriers to trade such as tariffs and border controls. In the eurozone, trade is aided by adoption of an uniform currency. The European Union Association Agreement extends such similar economic policies to a much larger range of countries, partly as a so-called soft approach ('a carrot instead of a stick') to influence the politics in those countries. The EU has a policy to improve cross-border infrastructure, see Trans-European Networks. The European Union has legislated in the area of energy policy for many years, and evolved out of the European Coal and Steel Community. The concept of introducing a mandatory and comprehensive European energy policy was approved at the meeting of the European Council on October 27, 2005 in London. The EU currently imports 82% of its oil and 57% of its gas, making it the world's leading importer of these fuels. The EU has enacted a series of directives concerning wastewater treatment, drinking water and water resources management that have a profound impact on water and sanitation infrastructure investments in EU member countries (see EU water policy). In particular the wastewater directive is considered by the European Commission the most cost intensive European legislation in the environmental sector. The EU directives related to waste management, such as the Landfill Directive and Waste Incineration Directive have also had a significant effect on practices in its member states. These relate to the improved use of resources by improving waste treatment according to the waste hierarchy, reducing landfilling of biodegradable waste and increasing recycling rates. 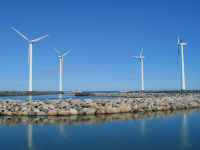 Member states have legally bound the EU to use 20 percent renewable energy and cut carbon dioxide emissions by at least 20 percent from 1990 levels, by 2020. Within the same year, one-tenth of all cars and trucks in EU 27 shall be running on biofuels made from plants. This is considered to be one of the most ambitious moves among world powers to fight global warming. The population of the European Union is that of its member states, and changes with each accession (or, more rarely, secession). Each change in membership also affects demographic averages such as life expectancy and fertility rate. The total population of all member countries is approximately 494 million inhabitants as of January 2007. Expected short-term accessions (Croatia) will not substantially increase this figure. Growth in the short term is coming from net migration, since deaths outnumbered births in 2006. At 1.52, the EU has one of the lowest fertility rates in the world, well below the level required for replacement. After 2025, this negative natural increase will probably exceed net immigration, and (discounting new accessions) population is expected to decline gradually. The European Union is home to more global cities than any other region in the world. Over 16 cities with populations over one million inhabitants, counted in its city proper. However, different countries deal differently with large cities. The Greek city Athens, for example, has about 4 million inhabitants, however it has been divided into many municipalities making the city proper of Athens one of the smaller European capitals with about 800.000 inhabitants. Densely populated regions that have no single core but have emerged from the connection of several cites and are now encompassing large metropolitan areas are Rhine-Ruhr having approximately 10.5 million inhabitants (Cologne, Dortmund, Düsseldorf et al. ), Randstad approx. 7 million (Amsterdam, Rotterdam, The Hague et al. ), Frankfurt Rhine Main Area approx. 4 million (Frankfurt, Wiesbaden et al.) and the Upper Silesian Industry Area approx. 3.5 million. ( Katowice, Sosnowiec et al.). The Latin alphabet is used in all but three of the twenty-seven member states, the exceptions being Greece, Cyprus and Bulgaria. The European Union has 23 official and working languages: Bulgarian, Czech, Danish, Dutch, English, Estonian, Finnish, French, German, Greek, Hungarian, Italian, Irish, Latvian, Lithuanian, Maltese, Polish, Portuguese, Romanian, Slovak, Slovene, Spanish and Swedish. German is the most widely spoken mother tongue followed by English, French, and Italian. English is by far the most spoken foreign language. French and German follow next. 56% of EU citizens are able to hold a conversation in one language apart from their mother tongue. 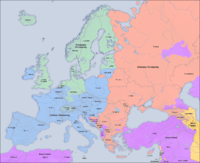 All EU official languages belong to the Indo-European language family, except Estonian, Finnish, and Hungarian, which belong to the Finno-Ugric language family, and except Maltese, which is a Semitic language. All EU official languages are written in the Latin alphabet, except Bulgarian, written in Cyrillic, and Greek, written in Greek alphabet. The EU provides interpretation, translation and publication services in its official languages, but only legislation and important documents are produced in all 23 official languages; other documents are translated only into the languages needed. For internal purposes the EU institutions make their own language arrangements. The European Commission, for example, conducts its internal business in English, French and German, and goes fully multilingual only for public information and communication purposes. The European Parliament, on the other hand, has members who need working documents in their own languages, so its document flow is fully multilingual from the outset. In the EU, language policy is the responsibility of member states, but EU institutions, based on the "principle of subsidiarity", promote the teaching and dissemination of the languages of the member states, through a number of programmes, most prominently Lifelong learning Programme 2007-2013. Translation booths in the EU Parliament are on the front-side walls. There are about 150 regional and minority languages, spoken by up to 50 million people. Catalan, Galician, and Basque, though not official languages, can be used in the communication of the citizens with the Council of the European Union, the Commission, the Economic and Social Committee, the European Parliament and the European Ombudsman, as well as in the workings of the Committee of the Regions. Though regional and minorities languages can benefit from EU programmes, protection of linguistic rights is a matter for the member states. A wide variety of languages from other parts of the world are spoken by immigrant communities in EU countries. Turkish, Maghreb Arabic, Russian, Urdu, Bengali, Hindi and Balkan languages are spoken in many parts of the EU. Many older immigrant communities are bilingual in the local language and in that of their community. Migrant languages are not given formal status or recognition in the EU or in the EU countries and they are not covered by EU language teaching programmes. The EU is an officially secular institution, hence neither God, nor Christianity was mentioned in its proposed constitution, in spite of pressure from the churches. Most of the Member States are secular states, although a small minority are not (the United Kingdom, Denmark, Greece and Finland) and others have references to Christianity in their own constitutions while officially remaining secular (e.g. the Irish Republic). Germany's Chancellor Angela Merkel has promised the Pope that she will use her influence during Germany's EU presidency to try to include a reference to Christianity and God in a revived constitution. However, this has provoked opposition, not the least in the German press. A significant religious diversity exists among the populations of EU member states, reflecting their diverse history and culture. Nowadays, religion is on the decline in Europe, to an effect that not all populations have religious majorities. In the Czech Republic and Estonia, for example, a majority has no religious affiliation. The most common belief in the EU is Christianity, which can be roughly divided into Roman Catholicism, a wide range of Protestant churches and Eastern Orthodoxy. The Christian churches have historically wielded much power in Europe. As a reaction during the enlightenment, secularism was developed as a political system, allowing for a rise in atheism and agnosticism. Judaism has had a long history in Europe—there were Jewish communities in parts of Europe prior to the rise of the Roman Empire. Over the millennia, there has been a great deal of discrimination against Jews, varying over time and from place to place; sometimes the persecution resulted in a number of expulsions from various countries, and there have been several genocide attempts. The recent influx of immigrants to the EU nations has brought in various religions of their native homelands, including Islam, Buddhism, Hinduism, the Baha'i faith and Sikhism. The European Commission initiated the ERASMUS programme for higher education. 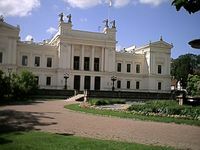 It was established in 1987 and forms a major part of the EU Socrates II programme. Its name is an abbreviation of "European Region Action Scheme for the Mobility of University Students" and has been styled after the life of Desiderius Erasmus. It was incorporated into the Socrates programme when that programme was established in 1995. The Socrates programme ended in 1999 and was replaced with the Socrates II programme in 2000. Other educational programmes include Leonardo (secondary schools), Grundtvig (adult learning) and Arion (teaching decision-makers). The stated aim of ERASMUS is to encourage and support academic mobility of higher education students and teachers within the European Union, the European Economic Area countries of Norway, Iceland and Liechtenstein as well as the candidate country Turkey. 2,199 higher education institutions are participating in ERASMUS across the 31 countries involved in the Socrates programme. 1.4 million students have already taken part. Member states of the EU are, along with other European nations and several international NGOs, signatories to the Bologna process. This is an attempt to create a European higher education area, by making academic degree standards and quality assurance standards more comparable and compatible throughout Europe. It is named after the place it was proposed, the University of Bologna with the signing, in 1999, of the Bologna declaration by ministers of education from 29 European countries in the Italian city of Bologna. Governmental meetings have been held in Prague ( 2001), Berlin ( 2003) and Bergen ( 2005); the next meeting will take place in London in Spring 2007. The Galileo positioning system (or simply 'Galileo'), is a proposed Global Navigation Satellite System, to be built by the European Union and launched by the European Space Agency (ESA). The current project plan has the system as operational by 2010. Several other nations are joining the project co financing the development such as China, Israel, India, Morocco or South Korea. ESA is a non-EU organisation and its membership includes non-EU countries such as Switzerland and Norway. Both countries are, however, within the EFTA. There are ties between those organisations, with various agreements in place and being worked on, to establish the legal status of ESA with regard to the EU. There are common goals between ESA and the EU, and ESA has an EU liaison office in Brussels. The EU is also sponsoring a large number of research projects aimed at academics and institutes, organised in frameworks of calls. From 2007 the EU has opened its 7th framework for grant applications. Attitudes and values of the EU population are very diverse, influenced by social class, religion, level of education, and ethnicity, and they are not necessarily either European or national in character. The interests of member states are mainly economic and political in nature. There is no single culture or lifestyle common to the entire EU population. Some are local, national or regional. 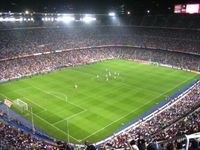 There are aspects of popular culture which can be found all over the EU, such as football, but none are limited to the EU (they may be equally influential in non-member states in Europe, and some are global). Cultural cooperation between member states has become a community competency since its inclusion in 1992 in the Maastricht Treaty. Actions taken in the cultural area by the European Union include the Culture 2000 7-year programme, the European Capital of Culture programme, the European Cultural Month event, the Media Plus programme, experimental actions and the awarding of various grants. The European Union gave grants to 233 cultural projects in 2004 and launched a webportal dedicated to Europe and Culture, responding to the European Council's expressed desire to see the Commission and the member states "promote the networking of cultural information to enable all citizens to access European cultural content by the most advanced technological means." Sports, including spectator sports, are popular in EU countries: the most popular is football. Cycling, tennis, and field hockey are also widely watched and played in the EU. Other sports are favorites in fewer countries, such as ice hockey, rugby, handball, and motorsports; and several sports are unique to one or a few countries (e.g. cricket in the UK, hurling, Gaelic handball and Gaelic football in Ireland and korfball in the Netherlands and Belgium). Although it recently launched an anti-doping convention, the European Union plays a minor and mostly indirect role in sport policy. Sports are normally considered to be outside the competences conferred by the member states to the European Union. Sports are also organized nationally, on a European continental level (which is not the same as the level of the European Union), or globally. The European Union does not have specific sports policies. The role of the EU could increase, if (for example) the European Constitution were to be ratified. Yet other policies of the EU can have an impact on sports, as famously exemplified by the Bosman ruling, which, among other things, prohibited national football leagues from imposing quotas on foreign players from other EU states. This ruling subsequently forced UEFA to modify the rules for all its European members. The Bosman ruling also gave all EU players the right of free transfer after expiration of their contracts.